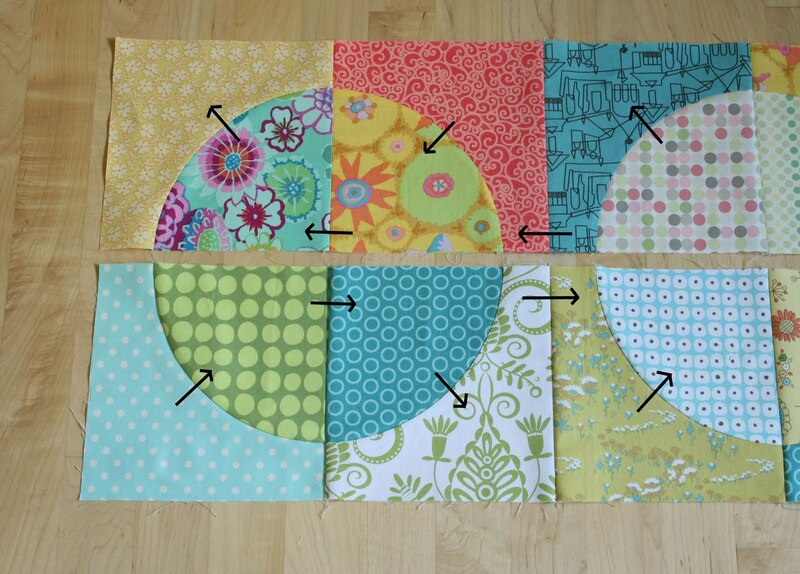 Have you ever rebound a quilt just because you found a better binding fabric in your stash? Isn't it so much better? You can see the entire quilt here. This quilt top was made by my sister. She didn't like it, but I did. When she asked me if I wanted it, I said "sure." So you see, I rescue not only fabric, and quilt blocks, but you can add quilt tops to the list, too. Are you noticing that this issue runs deep? Really deep. The quilt top came home with me and it sat in the "to be quilted" stack for awhile. When I finally got around to finishing it, it went quick. Love baby quilts for that reason. I did a simple stipple all over in neutral thread. I backed it with a brown dot from JoAnn's from their nursery collection, which has GREAT dots, by the way. The binding is David Walker robots. I LOVE that fabric! I love how the binding completes this quilt so nicely. My husband was going to give it to a co-worker, but I love it so much that I might stash it and keep it for someone that I actually know. It never hurts to have an extra baby boy quilt on hand. It seems like a lot of my friends are pregnant and someone is bound to have a boy. The quilt measures 40" x 50". I'm so happy to see this finished! So, Clair, what do you think? And the winner of the GO! baby cutter is A Dilettante of Fruition. Thanks to everyone who played along. I loved reading your thankful lists. On the flip side, I did finish this quilt top this week. It measures 44" x 53". I blogged a bit about the process here. I love how it came together! The red and white polka dots are a fun addition to the quilt. But then again, you really can not go wrong with red and white polka dots, if you ask me! Since I need another quilt like I need a hole in the head, I'm pretty sure that this top will be headed to MHC. Some friends of mine are getting married in August, and I'm making them a quilt. Rather than try to guess what they would want, I asked for their (her) preferences. She said "think fall". I LOVE fall, but fall colors aren't my normal go to colors for quilting. I spent a few days (weeks?) mulling over a pattern. I decided to make yet another 9 patch quilt. I'm using Kona jelly rolls in dusky and dark. It's been so fun mixing and matching the colors. So far, I'm loving it! I have 7 9 patches left to make, then I get to assemble the top. I am enjoying watching this one take shape! I'm sooooo excited to be hosting this giveaway today. The fine folks at AccuQuilt are allowing me to giveaway a GO! Baby cutting system and 3 dies (your choice!) to one of my readers. To enter, please leave ONE comment on this post. In your comment I'd like to include 3 things that you are thankful for. 1. I'm thankful that my kids are playing reasonably well together today. That means mama gets some time to sew! Yipee! 2. I'm thankful for a great weekend with my husband, kids and good friends. 3. I'm thankful that we are already enjoying fresh veggies from the garden. What a treat! Happy Monday to you! And good luck! edited to add: the giveaway is now closed. Last Saturday I was playing with my "uglies". (See this post for reference.) I sewed together a bunch of half square triangles that will finish at a measly 2". I knew better than to throw them in a WIP box. If I did, chances are I would never want to touch them again. So, up on the design wall they went. Then, I thought, "hmmm, my reclaimed stars would look good with these". I added them in. I like it! Just for kicks, I added some Kona 9 patches I had laying around for the outside border. Now I LOVE it! I love that this quilt is progressing nicely and all quite by accident, it seems. I love the traditional feel of it. The goal is to make it into a full size quilt for my brother in law. I recently had the chance to review the book Flirt Skirts by Patti Gilstrap and Seryn Potter. I'm not normally a fan of sewing clothes, but if I were to sew anything for me, chances are it would be a skirt. I loved this book! It has instructions for 3 basic skirt types: A-line, Pencil and Flare, in sizes 2-14. It takes you through how to determine your size & fit, it shows you how to draft a pattern in your size and how to alter it, if needed. It also shows you how to make each of those three basic skirts, step by step. Then, it shows you how to use those basic skirt skills and kick it up a notch. It has 20 different patterns for customized skirts. It also has a section at the back of the book about how to putting your look together. That was a neat addition, I thought. The authors made it look easy enough, but I wanted to see if I could do actually do it! I'm a simple girl, so I tried sewing a basic A-Line skirt pattern. Overall, things went very well! I did a bit of seam ripping, but that's to be expected. ﻿The fabric I used is Flora and Fauna by Patty Young for Michael Miller. I bought it with the sole intention of making a skirt. (7 months ago) :) I LOVE the border with the 2 toned dots. Anyway, back to the skirt construction. I made this skirt from start to finish today! I pre-washed and ironed my fabric. I drafted my pattern (not a big fan of the process, but it wasn't too bad), I sewed an invisible zipper for the first time ever in a garment (feeling pretty great about that one! ), and also used single fold bias tape for the first time. The instructions were easy to follow and very accurate. I LOVE my new skirt. It fits very, very well and I'm sure I'll wear it a ton. I give the book 2 thumbs up! Since attending Penny's retreat back in April, I haven't really done much, or should I say any, paper piecing. It's a shame, since I learned some really cool things. It's amazing (and scary) how quickly I forget things. Melinda and I decided that we are going to try to keep up and hopefully expand our skills by making one fancy block a week. Tara, Audrey and Carmen may be joining in from time to time, too. At the retreat, Penny had us make a sketch of something we wanted to make. She showed us how to number it, then paper piece it. I wanted to make a mini place mat, and I thought a bowl and spoon would be kind of cute. This block was my first attempt. It turned out ok, but I wanted to remake it and see if I could do it again, without supervision. (Ha!) My goal was to make it less wonky this time. Some of the curves on this piece were intentional, but it was causing some unnecessary work, and more importantly, unnecessary seams. I was working on this block yesterday, and man, oh, man, did I struggle! It was so frustrating! I did a ton of stitch ripping, to the point of my paper almost wore out completely. Thankfully, something clicked eventually and I remembered what I had to do. What a relief! You can see Melinda's fancy block here. I made this little quilt for a friend that is expecting her 3rd baby this summer. Having 3 kids myself, I know how fun it is to get something special for the younger ones. These so are "her" colors, and it just happens that I had plenty of them on hand in my stash. Sweet! Most of the fabrics are from the Birchtree Lane collection from Connecting Threads. These fabrics are so perfect for a boy quilt! To round things out, I threw in a sweet little print from my LQS, a bit of David Walker robots and some Robert Kaufman mingle. My daughter actually cut these out for me using my GO! baby (can you say sweet???) and the 5" circle die. The GO! cutter made such quick work of the circles. 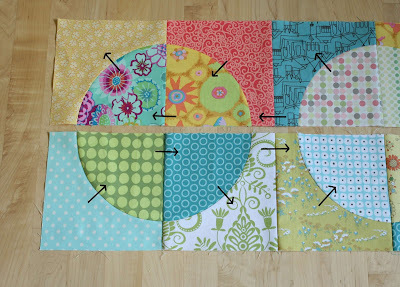 I certainly will be making more circle quilts! The backing is Denyse Schmidt dots from JoAnn's. LOVE this print! I really wanted to continue hoarding it for myself, but ﻿I'm glad I used it, because it was THE perfect match. For construction of the circle blocks, I basically used this tutorial, but I used 6.5" squares rather than 6" for the background blocks. The circles frayed ever so gently after washing. I love the subtle texture that it adds-absolutely perfect for a baby quilt! I rolled it up and tied a ribbon around for gifting, letting the label peek out. So simple and easy and sweet. The quilt measures 42" square. I gave it to my friend yesterday and she loved it. Hurray! Thanks so much for all the kind comments on my running in circles quilt. I had so much fun making it! It was great to start and finish a quilt in one fell swoop. It's been quite awhile since I did that. I took photos along the way so I could share a tutorial. This is June's free stash buster quilt pattern. I hope you enjoy it! 28 mm rotary cutter-this is a must! It really helps you cut the inner curves with ease. Fold each piece of fabric in half, so you can cut 2 layers of fabric at once. I wouldn't recommend cutting more than 2 layers at once, for accuracy sake. Layout your templates on the fabric and cut carefully! After cutting, you should have 2 pieces of the outside curve and 2 pieces of the inside curve. Cut a total of 80 pieces of each. All seam allowances are 1/4" throughout. Take a piece of fabric from each pile and pair up ALL your fabrics before you sew. You don't have to do this, but it will help you avoid ending up with 2 pieces of the same fabric at the end. It will also help you avoid ending up with some unpleasant fabric combo in the end. I did a fair amount of matching and rematching before I sewed anything. I'm so glad I did! Take one pair of fabrics and fold each piece in half. Cut a very small notch in the inner center of each piece. This will show you where to pin. Pin at the top and the bottom of the block. All you need is 3 pins per block. When pinning the top and the bottom, go up and down through the fabric twice. This helps keep the fabric in place much better than if you only put the pin through the fabric once. It's a little tip that yields great results. Try it! This is what it looks like when it is pinned. It looks pretty funky. But it WILL come together! Put the piece in your machine and sew slowly. Try to maintain an accurate 1/4" seam allowance. Pull any bulk up and away from you as you sew slowly. This little tip is key! This will help ease the curves together. Continue sewing slowly while matching up the edges of the curve as you go. Remove from your machine and check your work. It looks pretty good! It is a bit off on the bottom, but not too much. Definitely nothing to worry about. Sew all 80 pairs together first. Layout all the blocks and take a photo (or several), arranging the blocks until the colors are evenly distributed. Now it's time to iron! I started assembling the quilt from the bottom, so I took the two left blocks from the bottom row. For the block on the left, iron the seam toward the center. For the block on the right, iron the seam toward the outside. Do a quick press with the block upside down first. This allows you to see where you are ironing. This is helpful because sometimes the curve wants to flip in the middle of the seam. Then, flip the block over, so it's right side up. I found it very helpful at this point to do a quick spritz with some spray starch. Press again. Place the two blocks together and pin. Again, only 3 pins are needed. One at the top, one where the seams meet, and one at the bottom. Pin the one where the curved seams meet FIRST! The seams should be pressed in opposite directions, so they should nest together neatly. Starting to pin at the middle pin will help you get accurately pieced circles. If the ends are a bit off, don't worry. Those will be hidden in the seam allowances. If your ends are way off, you may consider doing some stitch ripping. Sew the two together, and press the seam to the right. Sew the remaining blocks in the bottom row in pairs, then sew the pairs together, until all the blocks in the row are joined. Press all seams to the right. The bottom row should be complete! For the next row up, press the seams in the opposite directions. The first block's curved seam will be pressed toward the outside of the block. The second block's curved seam will be pressed toward the center. After joining those two blocks, the seams will be pressed to the left. The diagram below will help explain what I mean. The goal is to get all the seams in the two rows pressed in opposite directions so the seams will nest and lay flat when sewn together and pressed. It looks complicated, but really, it's not so bad! Now that the bottom two rows are assembled, it's time to pin. Again. Pin at each seam intersection, for accuracy sake. I had a little bubble in this block, so I pinned in the middle of the curved piece. It will help me ease the bulk evenly in the space. If there aren't any bubbles, pinning in the middle isn't really necessary. Sew and press. Then admire your work! It's so fun to see the circles come together. Repeat these steps for the remaining rows. Once the pairs of rows are together (there are 5), sew together and the quilt top is complete! The quilt top measures 56" x 70". Baste, quilt, bind and snuggle! You can see the completed quilt here. I really, really hope that I've taken the fear out of piecing curves, because it's not that hard. I hope you try it and have fun with it! A huge thank you to my neighbor Marcia, for letting me use her templates AND for taking the time to teach me this method. Plus, she was kind enough to let me share all her handy dandy tips with all of you. Thanks Marcia! If you use this tutorial to make a quilt, I'd love to see it!